The U16 As set out at first light on Sunday for their first Quins Cup group match at Old Emanuel, kick off scheduled for 9:30. Blowing the dust off the history books showed a single match between the two sides at the Surrey Under 8 tag festival, so there was little to go on to know how they would play. Arriving at the ground a steady stream of big lads gave the first clues of what to expect. Sure enough OE looked to play a physical game, running pods of two one out from the scrum-half. Following a penalty conceded from the kick-off OE brought their biggest runner to the fore to test the Chob defence. 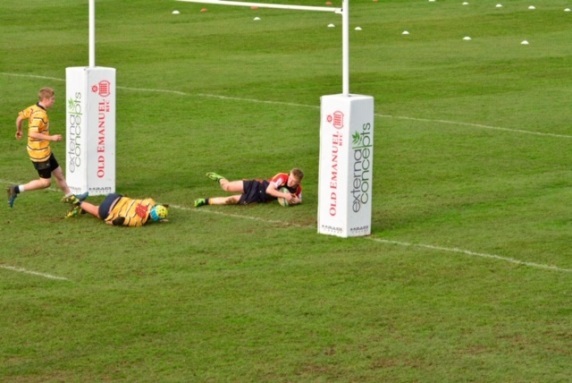 Another penalty was given away at the ruck and OE pushed to the corner for an attacking line. The throw was too long and Doug grabbed it safely to allow a clearing kick. With a narrow angle it fell to the OE fullback who returned it to the opposite corner for his backs to chase. Rhys collected the kick safely and managed to hang on long enough for the cavalry to arrive. Unfortunately the cavalry hadn’t played for several weeks and a fluffed clearance gave OE the ball back in good field position. Using their battering rams, stoutly defended by Chob, play worked its way across the field to the right of the posts. Finally the blue line was breached and OE had an early 7-0 lead following a successful kick. The restart was kicked deeper into OE territory this time and gave Chob a lineout in OE territory. 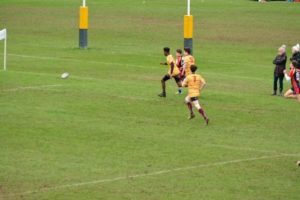 A rare OE indiscretion led to further line much nearer to their line, with an early lift giving the visitors a free kick. A quickly taken tap gave Chob their first chance as Fin burst through in midfield but the home defence was able to react and snuff out the danger. The game continued in similar vein to the opening minutes as OE tried to bust holes in the Chob defensive line, and Chob struggling to win enough possession to mount any meaningful attacks of their own. The visitor’s line was working well and they pinched a throw on the left side which gave the backs a first opportunity with space to run into. 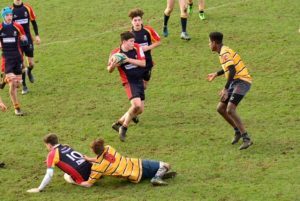 Jack produced a chip down the right touch line, but the opportunity seemed lost as the OE defenders chased back, Rhys showed them all a clean pair of heels to win the race and dot down wide out. It was now a two point game. 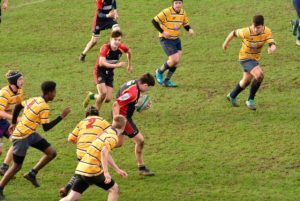 Chob continued to give away simple penalties as they tried to play a more expansive game than their hosts, and were put under pressure by their 10 man game plan. Chob defended well with their backs right on the try line with everyone stepping up to keep the home side out approaching the whistle. 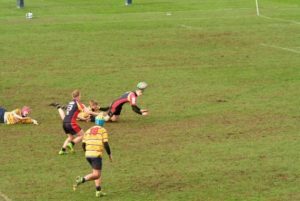 An OE scrum five yards out was pinched against the head giving a chance to clear the lines with a kick, but the choice was made to run from defence and a loose pass handed the advantage straight back. A scrum and two phases later OE crossed once more to extend the lead back out to 12-5 at the break. At the restart Chob immediately looked to hit back as they fought their way into OE territory. With the line free a final pass didn’t quite go to hand and OE ended up with a penalty and a clearing opportunity. The kick fell to Gideon rather than into touch, and he deftly stepped the chase and chipped down the narrowest of channels, winning the race to it and reducing the deficit to two points once more. Chobham were now looking the team ‘most likely’ as only the lopsided penalty count prevented them from squeezing OE out of the game. Play was almost exclusively now in the OE half as Chob continued to press. Akin made inroads from and 8 pick scrum on the OE 10 and the forwards piled on through to set the backs up. A pass in midfield went to ground, but crucially backwards, as Jack was first to the bouncing ball. Once more speed was the key as he outstripped the defence and was able to score under the posts, giving Chris a simple opportunity at the extras. Chob were now in front for the first time at 17-12. This was the catalyst for Chob, as OE seemed intent on kicking the ball straight to Jack at 15 and put them on the back foot. 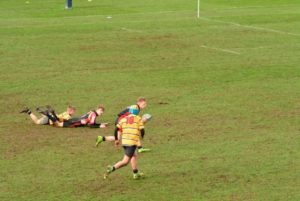 Good play from the forwards in recycling a couple of phases. A pass wide to Tommy in acres of space led to a third try from chasing a kick ahead as he scooped up his own grubber to extend the lead to 10. OE tried to get back in the game as they ground forward along the left touchline. Rhys made a key interception and OEs final attack was over. With Chob back in the red zone OE continued to kick possession back to Jack and Gideon, as they missed touch under pressure. 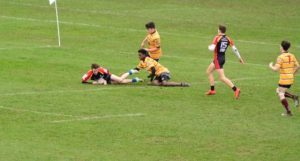 From one such kick Gideon darted through a tiring defence and when the last man managed to bring him down, Fin had anticipated the run and was able to gather the one handed pass and add the fifth try between the sticks. The victory was now safe with a couple of minutes to play and a 29-12 lead. George was under the kick and made a half break, and Dan was right on his shoulder to step inside a tackle break away with hitherto unseen pace. Seeing the try line was still half the pitch away he did what all good props do and gave a neat pass to Rhys to see if he could go the distance. The defence scrambled back however and were awarded a penalty for back chat and cleared to halfway. A blindside break from the lineout was read by Gideon who managed to tip and catch the ball, streaking away under the posts, with Chris completing the scoring and leaving the result as 36-12 to Chobham, and a bonus point win to open the group. A Squad: Jack, Rhys, Fin, Chris, Aran, George, Gideon, Dan, Charlie, Olly, Callum, Matt, Akin, Tommy, Doug, Connor, Harry.